Have you guys tried panna cotta before? It’s a fancy-sounding dessert that means “cooked cream” in Italian. If you told your guests you’d be serving them some cooked cream after dinner, they’d probably all politely pass. 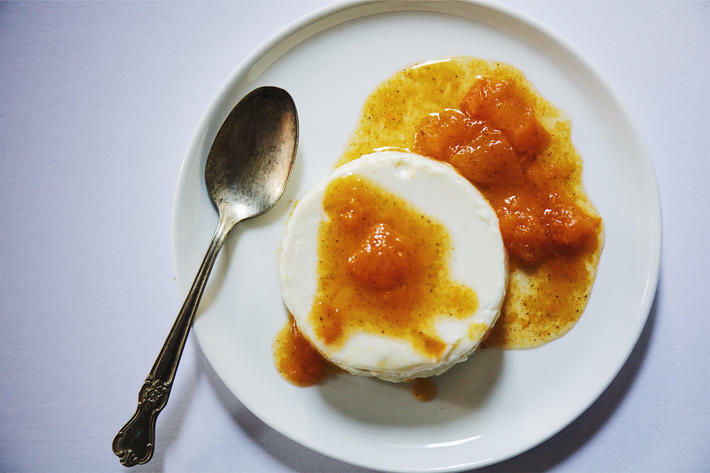 Which would be so sad because panna cotta is not only delicious and velvety, but super simple—completely opposite of how intimidating it sounds. Here’s the process: simmer some cream with sugar and a sprinkle of gelatin. Pour into ramekins and chill for a few hours. Then invert on a plate (prettier presentation) or eat directly from the ramekin. Best part is it can be made a couple days ahead so it’s the perfect dinner party dessert, especially with summer berries, peaches, and apricots. When the fruit is cooked down it becomes even more fragrant and the perfect pairing to creamy panna cotta. Some legit vanilla bean flavor in the compote is just the thing for the fruit flavor to shine through, but who has the patience to scrape those tiny seeds? Enter the life-changing vanilla paste. How have we lived without it? 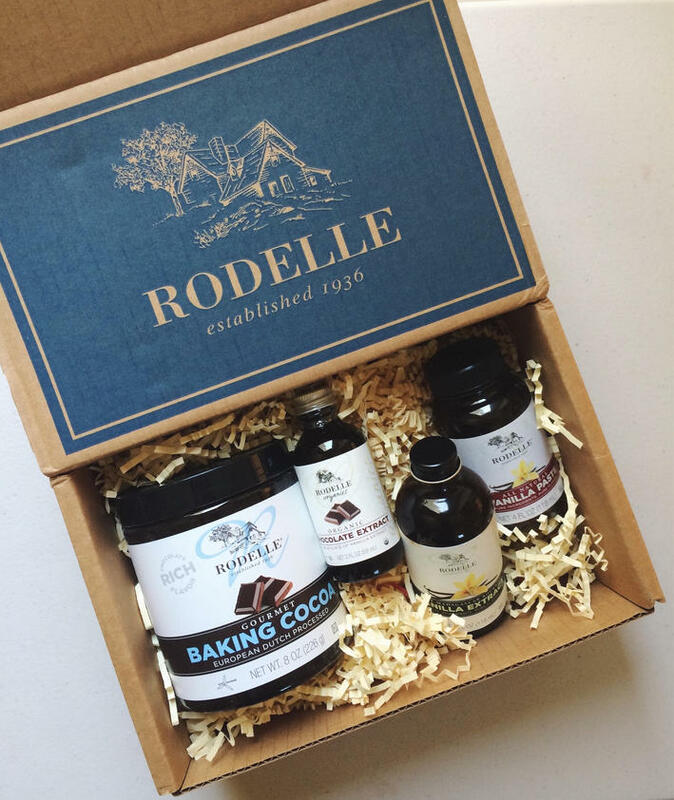 Rodelle carries the most amazing vanilla paste and we’ve been using it for months now in errrrything: French toast, roasted fruits, crepes, vanilla cakes, frosting, anything and everything. We got through a jar in less than a couple months, so we’ll be buying it in bulk from now on. We’ll never scrape a vanilla bean again. In a small cup mix 2 tablespoons of warm water and gelatin together. Set aside. Make Panna Cotta: Combine the cream, sugar, 1 tablespoon vanilla paste, salt, in a small saucepan over medium heat and bring to a simmer. Remove from the heat, pour in the gelatin mixture, and stir until the gelatin has dissolved. Pour into 4 lightly oiled 6 oz. ramekins (coconut oil works great). Cover and refrigerate for 5 hours or overnight. For Apricot Compote: In a saucepan melt the butter over medium heat. Add the apricots, ½ cup water, 2 tablespoons honey, 2 tablespoons of vanilla paste, and salt. Simmer for 10-15 minutes or until the apricots are soft and liquid thickens. Set aside to cool and then store in the fridge until needed. To serve: Run a sharp knife around the edges of each ramekin, place a small plate over the top, and invert so the panna cotta releases onto the plate. If it doesn’t release, dip the bottom of the ramekin into hot water for a few seconds and try again. 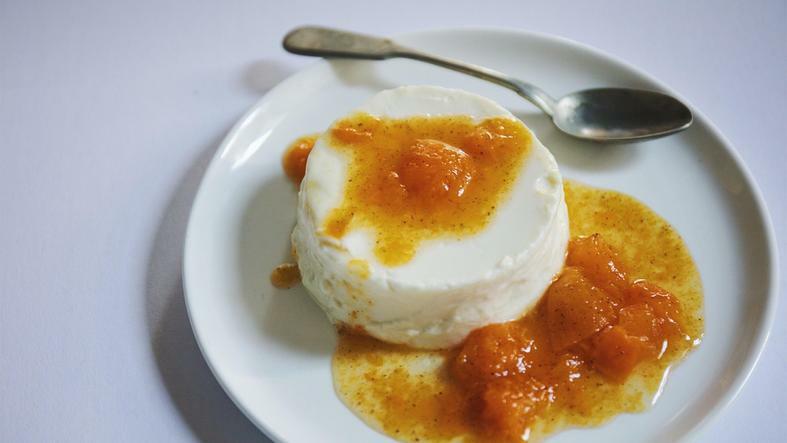 Spoon the apricot compote (cold or warm) on top of each panna cotta and serve.